It’s that part of the year again, when the whole world is enveloped by a cheery, festive atmosphere! Christmas trees, here and there, are decked up with lights and trinkets. The ovens are busy all through the day, and people are happily shopping – not for themselves but for others! Though it is one of the main religious functions for Christians, Christmas has now become a community event that is enjoyed by everybody across the world. Children stage plays, teenagers hold charity sales, and elders find innumerable ways to give and share, and tighten bonds with friends and family. Being vacation time for most kids, Christmas becomes double fun! One of the main activities associated with Christmas is the preparation and sharing of goodies with friends and family. The yummy treats are served to guests, shared with neighbours, and sometimes sold at charity sales too. The weather being nice and cold, the warmth of the kitchen and the aroma of spices are also very comforting and you are bound to enjoy every moment spent there. Children love to lend a helping hand, especially when you are making their favourite dishes, and you can let them do small and safe chores like shaping the cookies or mixing the batter. The Plum Cake is a mandatory recipe for Christmas. No amount of baking will make Christmas complete unless you churn out a batch of this! The Rose Cookies is an Indian innovation, a sweet snack with a dainty flower shape, which has become closely intertwined with Christmas culture in India. It does not require an oven and anybody can make it. Strawberries being in season in December, you must try your hand at making Chocolate Coated Strawberries and Strawberries in Custard Sauce. Another strawberry-based treat, the Oreo Cookie Santa is an easy-peasy snack that even kids can make. It is so pretty and unbelievably tasty; everybody will love it! Cookies like the Crispy Coconut Cookies and Eggless Chocolate Chip Cookies are other all-time popular treats. For those who like to do things with a difference, there is the unique and absolutely awesome Eggless Semolina and Coconut Cake, which is made with rava instead of plain flour. This gives the cake an enjoyably crumbly texture, which together with the flakiness of coconut makes the total effect mind-blowing. Christmas in India is all-inclusive – you can also make desi jar snacks like Shakarpara and Chakli. In fact, for those whose jars are laden with cookies and cakes, such desi snacks will be a welcome change, so do try sharing some of those too! There is fun in the air, and nobody can resist a treat or two in the weeks leading up to Christmas! 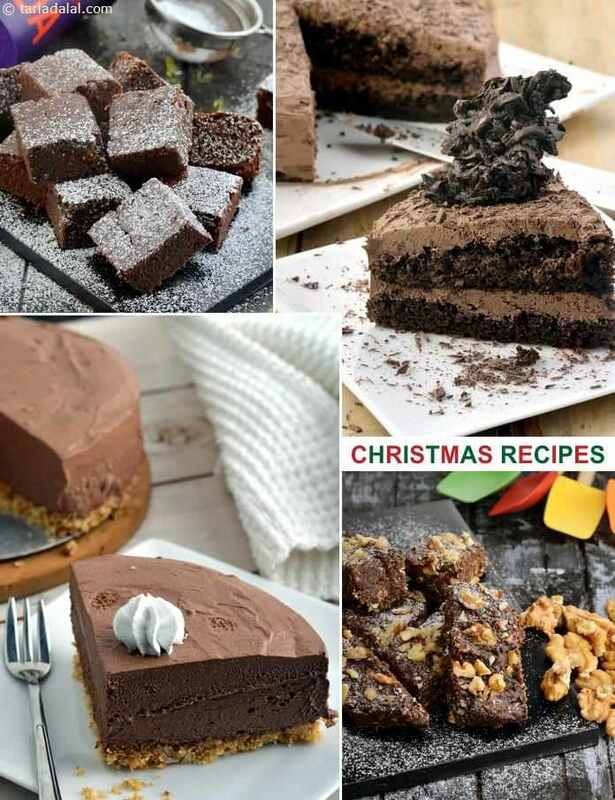 So, do try the recipes in this mailer, and also share them with your friends to make the festive season all the more special! A rich,goey chocolaty pudding made with fresh bread crumbs, condensed milk, walnuts and steamed in a pressure cooker. Tastes best when warm.